Just How Much Longer Is Codex Bezae’s Text in Acts? It’s frequently reported that the text of Acts is longer in the Western text than in the Alexandrian. But just how much longer is it? The most commonly cited number is 8.5%. You’ll find this in Metzger’s Textual Commentary (p. 223 n. 3). This number comes from F. G. Kenyon’s The Western Text in the Gospels and Acts published in 1939. But, interestingly, this number is not taken from comparing two manuscripts but rather two modern editions. Kenyon compared the text of WH in Acts with that of A. C. Clark. The former is taken as representative of the Alexandrian text and the latter of the Western. One other comparison I found was in Pete Head’s article on the text of Acts. He compared the text of Codex Bezae with the NA26/UBS3 and found the former to have 800 more words than the latter. Neither of these comparisons completely satisfied me though. In both cases, the comparison is made with a modern edition. I thought it would be better to compare manuscript with manuscript. To do that, I used two of the leading representatives of the Western and Alexandrian text: Bezae and Sinaiticus. I compared the text of their first hands in all places in Acts where Bezae is extant. (Bezae has lacunae in Acts 8.29–10.14; 21.2–10, 16-18; 22:10–20; 22:29–28.31) It turns out that the difference is minimal and Kenyon’s figures are about the same as mine. I found that Bezae is about 7.9% longer than Sinaiticus in Acts. The raw numbers are Bezae: 71,872 characters; Sinaiticus: 66,594 characters. One point about my method: I compared letters rather than words for reasons I’ll explain. The comparison is pretty straightforward. I took the transcriptions of both Sinaiticus and Bezae that are available for free in Logos Bible Software. These in turn come from INTF/ITSEE/IGNTP transcriptions which means their format is very similar. There’s clearly a lot of work behind both so a big thank you to those responsible. I copied the text from Logos into Word and stripped out extra content like verse numbers, punctuation, quire numbers, running titles, parentheses, ellipses, nomina sacra lines (because Word counted those as characters), etc. Basically, I cut everything out but the letters. The reason I counted characters is because these transcriptions are on the diplomatic end of the spectrum and that means that many individual words in Sinaiticus are split between lines. Putting all these back together did not seem like a good use of time. So instead I counted characters without spaces. I checked the count with charactercounttool.com. It’s nice to know that Kenyon’s method didn’t put us far off the mark. A couple links for your weekend reading. Timothy Mitchell whose blog I mentioned earlier has a fresh article in JETS on just what we mean by “autograph” in debates about inerrancy. He concludes that “in reference to the NT, the ‘autograph,’ as often discussed in biblical inerrancy doctrinal statements, should be defined as the completed authorial work which was released by the author for circulation and copying, not earlier draft versions or layers of composition.” I wonder what Tim thinks of suggestions that Paul edited his own letter collection with some possible changes. Would inerrancy apply to the first release or the release of the collection or both? I’m not sure we can distinguish such, but I still wonder. We need something like this for the OT, by the way. But good for Tim for taking the question on. 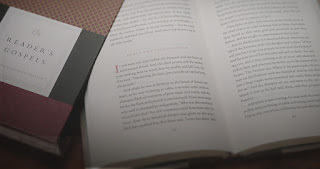 Tony Reinke interviews Glenn Paauw, the Executive Director of the Biblica Institute for Bible Reading about the history of “Bible clutter.” Paauw says that the Bible’s “central unit is not a verse, is not a chapter, it is a book. Those are the central units the Bible is built on, and I think we should read holistically first and then do our study in the context of that reading. And I think the modern Bible reverses those things.” A friend told me recently he is reading through Crossway’s Reader’s Gospel and really enjoys the lack of clutter. Enjoy your weekend. If you live somewhere with sun, please send it my way. 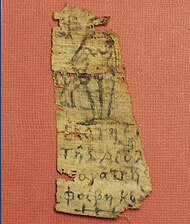 First edition of a Psalm fragment on a Greek papyrus coming from a settlement in the Western desert of Egypt. Discussion of its religious background (Jewish, Manichaean,or Christian?) and of its possible use, as an amulet? Attention is paid to a textual variant. Room 8 in Area D/8 has produced a significant number of (ca. 30) still unpublished fragmentarily preserved documentary papyri (like e.g., administrative texts, accounts, contracts, name lists, and letters, both private and official). This material provides at least some further idea of the dating of the archaeological context of the present Psalm fragment. and has a higher regard for the “Gnostic” gospels than the canonical gospels. Several of us have been convinced since October 2015 that Fritz played some central role in the Gospel of Jesus Wife saga. The first player in identifying Fritz as a person of interest was Owen Jarus of LiveScience, who interviewed Fritz much earlier, and directed me to Walter Fritz and his wife’s “Nefer Art” website. Here, I encountered a picture of the above Nefer Art Forgery (above), written in the sort of minuscule script (complete with accents!) appropriate to a modern printed edition. The cut along the left hand side resembles one on the GJW. The Greek text, apparently some sort of magical love spell, features a likely image of Venus with Cupid and references the Titan Phoebe and her daughter Hekate. I have not been able to determine the text from which this was fabricated. Pendants of the Virgin Mary holding Jesus in her arms. On the picture there is IC with a dash over it, which is the Coptic writing for “Jesus”. The little roundel in the lower part of the pendant contains a small, approx. 1/12” long papyrus fragment with the original black ink on it. I glued these fibers in between the picture and the glass. These fragments are really old and come from a larger christian papyrus, dating back to the 2nd Century A.D. The larger papyrus was probably part of a gospel or an early christian text, written in the Sahidic Coptic language. Coptic is is the final stage of the Egyptian language and consists of Egyptian words, written in Greek alphabet. Early Christians used the Coptic language, besides Greek, to write down the Gospels and other early texts about Jesus. | This is no hoax. I can guarantee that the small fragments in the roundel are indeed over 1800 years old. They date back in a time period shortly after Jesus’ crucifixion. I got these fragments from a reputable manuscript dealer who was restoring a larger papyrus with a christian gospel on it. The fragments were left over and couldn’t be incorporated into the big papyrus any more because they were so small. I have photos of the restoring process. Walter Fritz, ‘Bemerkungen zum Datierungsvermerk auf der Amarnatafel Kn 27’ Studien zur altägyptischen Kultur 18 (1991): 207-214. Walter Fritz thanks Prof. Dr. Jürgen Osing for the concept for the paper, having studied at the FU - Berlin with Osing in the summer of 1990. The article details a difficult reading of a Middle Egyptian Amarna tablet relating to the reigns of Amenophis III and IV, and describing the use of “Quarztlicht,” or UV light, which naturally is only useful when one is working with carbon-based inks. One has to know about the composition of ancient inks. The GJW and related forgeries all appear to have been written with carbon (=soot) mixtures. I offer here a timeline of where we have now arrived. Sept 2012 Karen King announces the discovery of the Gospel of Jesus’ Wife papyrus. Almost immediately, Francis Watson and Simon Gathercole notice a relationship between the GJW and the Gospel of Thomas. Nov 2012 Andrew Bernhard’s Patchwork Hypothesis proves that the GJW was copied from Grondin’s interlinear. Apr 2014 The current blog revealed that an accompanying papyrus with the same handwriting was a forgery, calling into question the authenticity of all of the accompanying documents. Aug 2015 With the revelation of the owner’s interlinear, Bernhard’s Patchwork hypothesis becomes irrefutable. June 2016 Walter Fritz, a former FU-Berlin Egyptology student, claims to be the owner of the GJW. Walter Fritz, owner of the GJW (photo credit). Wow. The most recent issue of The Atlantic has an incredible story uncovering the formerly anonymous owner of the Gospel of Jesus’ Wife papyrus. His name is Walter Fritz, a German-born man who now lives in Florida with his, shall we say, eccentric wife. Fritz denies forging the papyrus, but the reporter of the story seems unconvinced. And for good reason. The article is long but well worth reading. It gets stranger at almost every turn. It’s a fine piece of detective work by the journalist, Ariel Sabar. One thing did become clear, though. When we first started talking, Fritz had claimed that he had no stake in the papyrus’s message. But I began to see that he in fact cared deeply. As a teenager he wanted to become a priest, he said, but he later came to believe that much of Catholic teaching was “bullcrap.” Particularly flawed was the Church’s claim that the Gospels of Matthew, Mark, Luke, and John were truer accounts of Jesus’s life than the Gnostic Gospels. 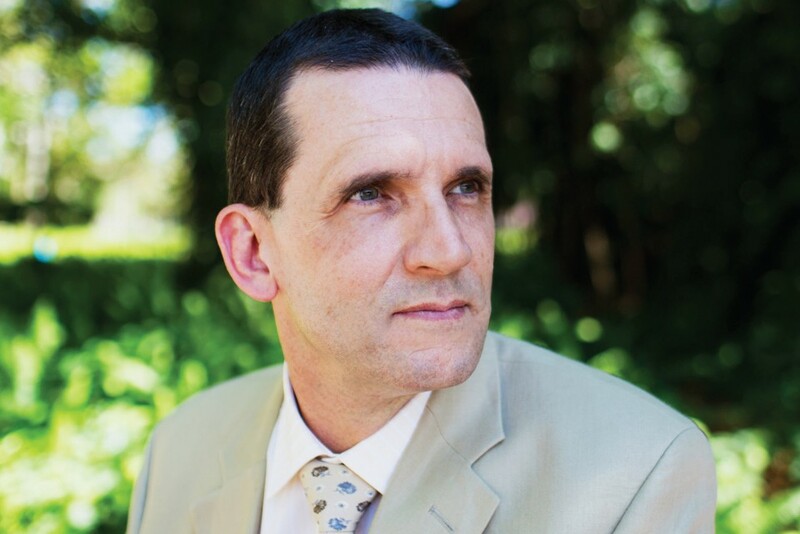 He pointed to the fact that almost no papyri bearing the canonical Gospels have been carbon-dated, because such testing would cause physical damage to the New Testament’s seminal manuscripts—damage that institutions like the Vatican Library would never countenance. But with the new ink tests at Columbia—the ones King had told me about—scientists can date papyri without damaging them. Fritz said these tests could well show that most of the Gnostic Gospels were written before the canonical Gospels, making them better witnesses to the historical Jesus—a view that virtually no serious scholars share. He [Fritz] had even more scorn for critics of the Jesus’s-wife papyrus, deriding them as “county level” scholars from the “University of Eastern Pee-Pee Land” who think their nitpicking of Coptic phrases can compete with scientific tests at places like Columbia University and MIT that have yielded no physical proof of forgery. I trust Christian will be updating his CV accordingly! 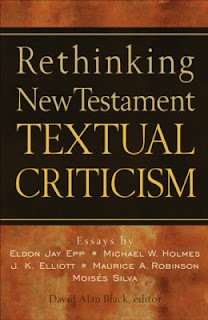 Besides the world-famous ETC blog, there are a number of other blogs that cover textual criticism. I’ve added these to the list of Biblioblogs in the sidebar so they should come up there whenever there’s a new post. They’re worth a read. Run by Timothy N. Mitchell who keeps helicopters running by day and moonlights as a text critic. He’s currently working on a PhD with Hugh Houghton via Birmingham on early Christian book culture. 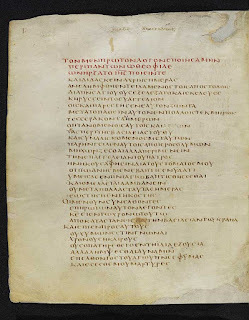 Peter recently finished a degree at Fuller and has done work on the Latin text of Irenaeus (?) if I remember past SBL meetings. He’s now turning his attention to the text of Codex Bezae in Mark with a PhD via Münster. Keep an eye on his blog for all things Bezae. An outlet for research and questions on the textual criticism of the Old Testament/Hebrew Bible and related issues. Drew Longacre is no stranger to our ETC comments section. He recently finished his doctoral thesis on “A contextualized approach to the Hebrew Dead Sea Scrolls containing Exodus.” He is now a postdoctoral researcher at the University of Helsinki and blogs far too infrequently in my opinion. We want more OTTC, Drew! 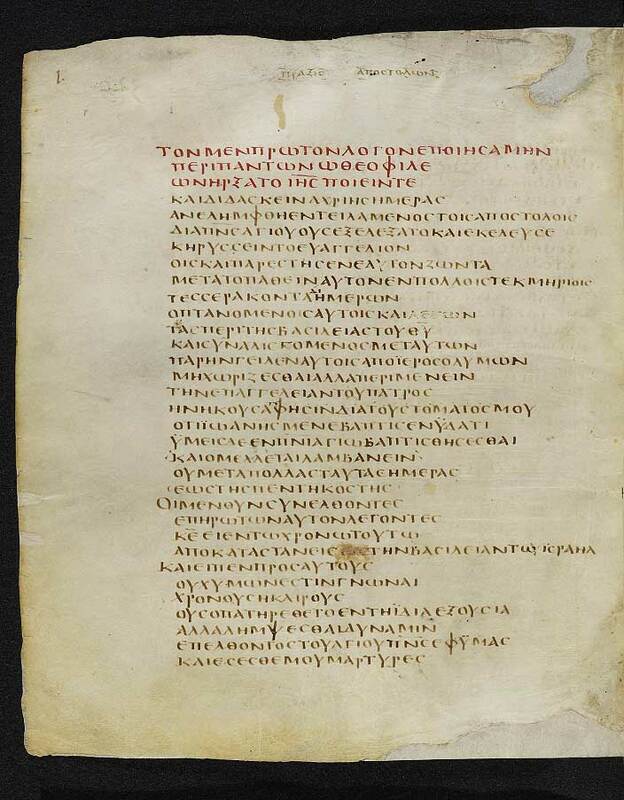 A blog about New Testament textual criticism, especially involving variants in the Gospels. Another blogger who is no stranger to the comments section is James Snapp. He is best known, of course, for his indefatigable efforts to keep us all honest about the evidence for Mark 16.9-20 and John 7.53-8.11. Check out his blog for some good posts on specific manuscripts. Update: Of course, I should mention the Amsterdam NT Weblog which often has text critical posts. I guess I was thinking of new blogs when I wrote this post. 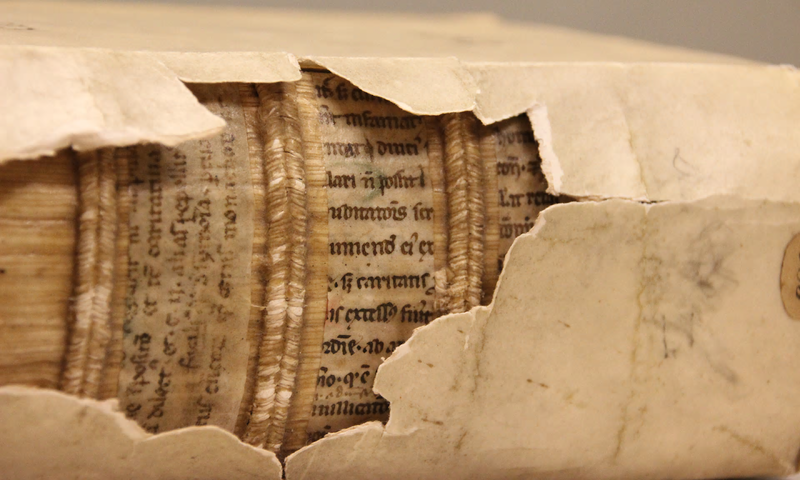 16th c. manuscript (photo credit). Bindings made between the 15th and 18th centuries often contain hidden manuscript fragments that can be much older. Bookbinders used to cut up and recycle handwritten books from the middle ages, which had become old-fashioned following the invention of printing. These fragments, described by Kwakkel as “stowaways from a distant past”, are within as many as one in five early modern age printed books. Apparently, the process is currently very slow, taking as long as 24 hours for one shot. As a development of Head’s Rule, the best place to find unknown manuscripts is inside known ones. Steven Lawson, "Portrait Of William Tyndale Begins Crying Blood After Release Of ‘Emoji Bible" The Babylon Bee, 2 June 2016. Here’s something that two otherwise competing methods of New Testament textual criticism agree on, at least according to their two main proponents. Both reasoned eclecticism and the Byzantine priority position have in common that external evidence should be considered prior to internal evidence. To put the matter more briefly and abstractly, it is by means of external evidence that we identify the oldest surviving reading(s), which we then further evaluate by means of internal considerations. In this system, final judgment on readings requires the strong application of internal evidence after an initial evaluation of the external data has been made. I would be interested to know if Mike thinks this priority is fundamental to reasoned eclecticism. I wouldn’t think so since a consideration of transcriptional probabilities may influence the weight one gives to a manuscript’s text, a weight which subsequently informs which readings deserve further evaluation on internal grounds. There is, obviously, a circularity here, but a “fruitful” one as some have described it rather than a viscious one. To be really thorough I suggest that we do our textual criticism eclectically without bowing to preconceived theories about the alleged superiority of certain witnesses. Then, having done our work, I suggest that we review the behavior of individual witnesses—in effect, rate them. Those that fall below a certain level of accuracy would in the future be regarded with some suspicion. Oddly, he then says that “I cannot claim that that is an overriding interest or concern of thoroughgoing eclecticism” which seems to undermine his suggestion. 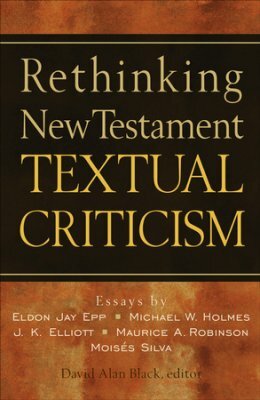 Michael W. Holmes, “The Case for Reasoned Eclecticism,” in Rethinking New Testament Textual Criticism, ed. David Alan Black (Grand Rapids: Baker, 2002), p. 78. Maurice A. Robinson, “Appendix: The Case for Byzantine Priority,” in The New Testament in the Original Greek: Byzantine Textform, ed. Maurice A. Robinson and William G. Pierpont (Southborough, MA: Chilton, 2005), p. 545. J. K. Elliott, “The Case for Thoroughgoing Eclecticism,” in Rethinking New Testament Textual Criticism, ed. David Alan Black (Grand Rapids: Baker, 2002), p. 123.